Perfect mini soccer or “rolling” ball for tots and pre-schoolers. About 6 inches in diameter. Ships flat, comes with inflation needle. Fair trade (i.e. sweat shop free, living wage) vegan and eco certified (FSC rubber) balls from a company that gives all after expense and tax profits to children’s charities. 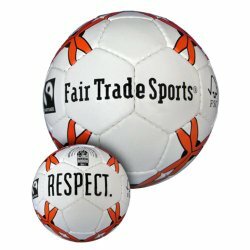 Made fairly in Pakistan for Fair Trade Sports.